Hop on over to Hedgehog.INK! April 13, 2019 at 10:00 a.m. 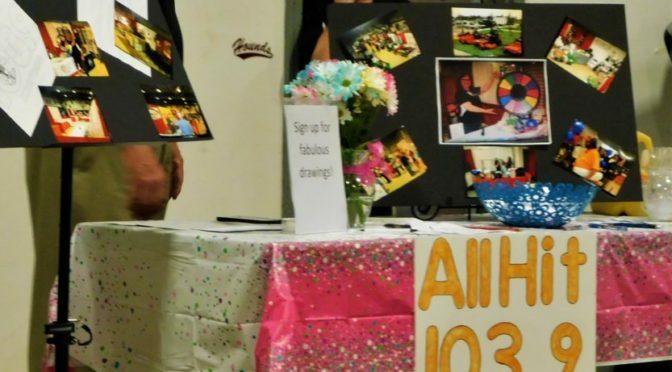 Approximately 60 vendors focusing on home, sport, farm and garden, plus booths of community entities, await you at the KOMB-FM 103.9 Home Show this weekend. 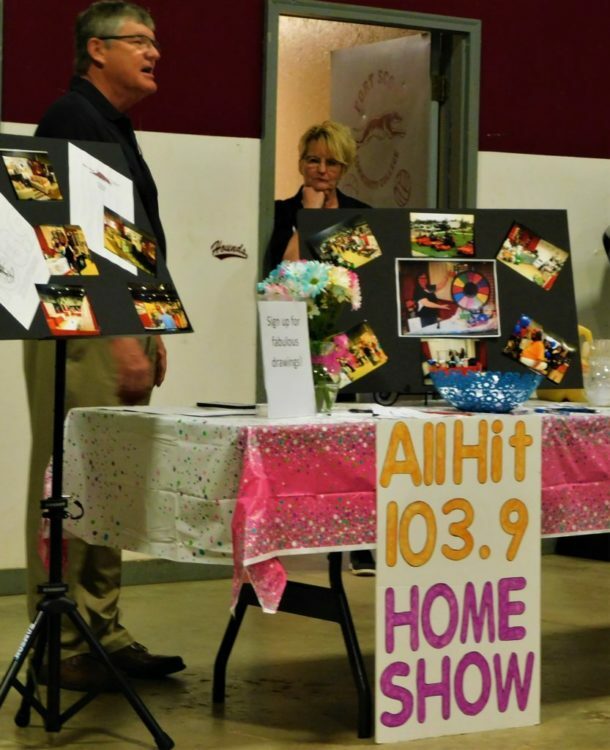 Fort Scott Broadcasting Company, owner of KOMB-FM and KMDO-FM is having its annual home show this Friday from 5-8 p.m. and Saturday, 9 a.m to 3 p.m. at Arnold Arena on the campus of Fort Scott Community College, 2108 S. Horton. Tim McKinney tells the Fort Scott Chamber of Commerce weekly coffee attendees about the home show this weekend. Deb McKinney listens in the background. Advantage Metals, Albers Marine, Ascension Via Christi, Autumn Exteriors, Bath Innovations, Blue Valley Trailers, Briggs Auto, Bourbon County Conservation District, BN Hunting Supplies, Busy Bugs Pest Control, Care to Share, Community Health Center, City of Fort Scott, Common Ground/Astra Coffee, Country Place Senior Living, Covey Garage Doors, The Fort Scott Area Chamber of Commerce/Healthy Bourbon County Action Team, FSCC Centennial Committee, Hague Quality Water, Heidricks Tru Value, Home Depot, Home Pro, Jim’s Sales, K-State/Southwind Extension District, LeafFilter, Live Local, Miller Feed & Farm, Momentum Indoor Training, Nemesis Contracting, Norris Heating and Air, O’Malley Implement, Phillip’s Lawn Care, Perry’s Pork Rinds, Pioneer Harvest Fiesta, Pro Active Agriculture, R II Concrete Construction, R&R Equipment, Redbud Farms, Rolox Home Service, Ruddick’s Furniture, Satellite Center, Seal Smart, Sharky’s Pub & Grub, Shirt Shack, SIT Solutions, Skitch’s Hauling & Excavating, Stewart Realty, Stutesman’s Action Realty, Sunscape Pool & Backyard, Thrasher, Inc., Tractor Supply Co., Twister Trailer, Visit Fort Scott, Wreath Ride, U.S. Cellular, and Yutzy Construction. 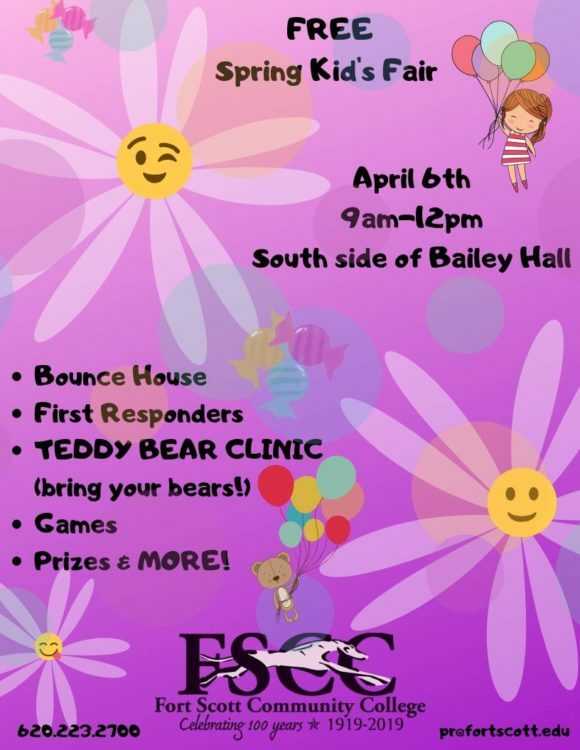 In conjunction with the home show, Fort Scott Community College is providing a kids fair from 9 a.m. to noon on April 6. 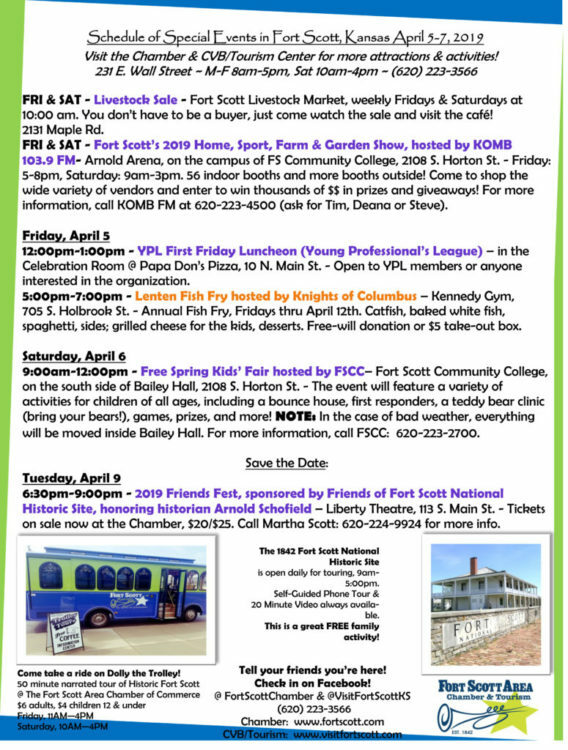 Parents can leave their children at the kids fair and enjoy the home show, said Fort Scott Communication Director Kassie Cate. 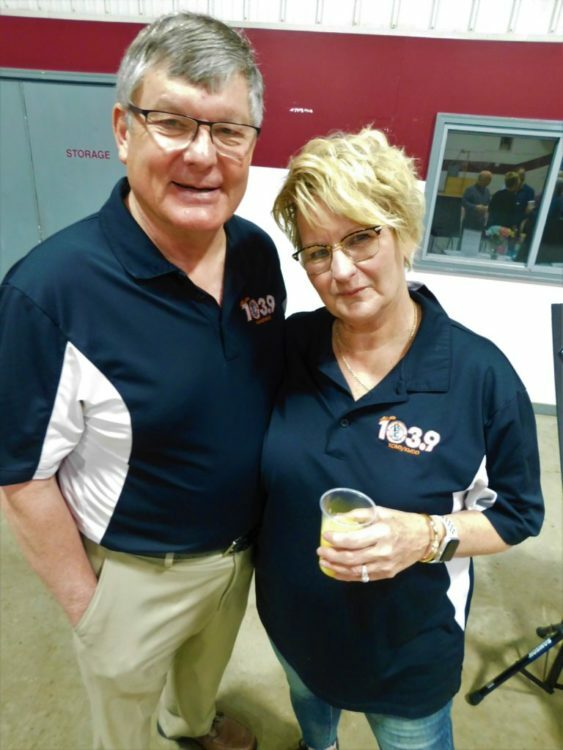 Tim and Deb McKinney, owners of Fort Scott Broadcasting and Central Communications. McKinney said his family opened the station in 1954 and the radio station is known for its local news, sports, talk and podcasts, live stream events, live play by play sports and more. It is headquartered at 2 N. National Avenue and can be contacted at (620) 223-4500. 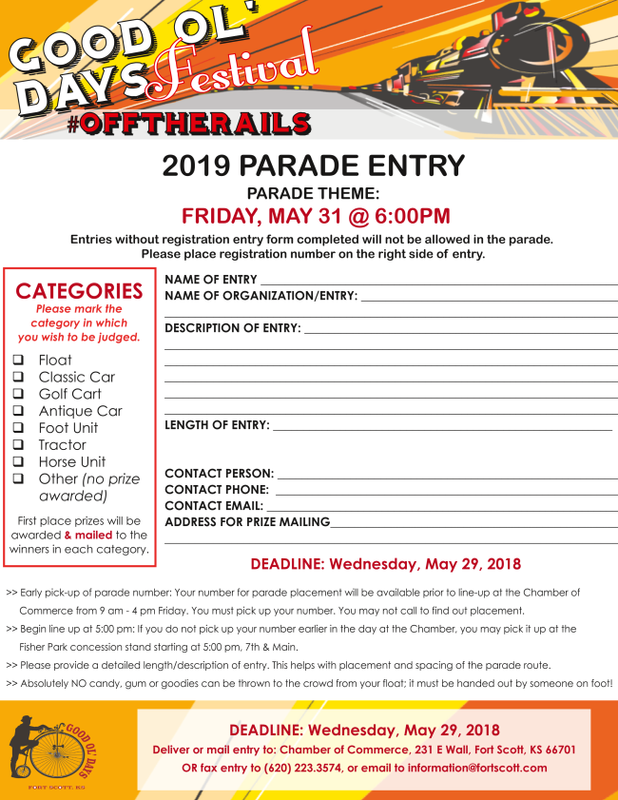 Entries without registration form completed will not be allowed in the parade. 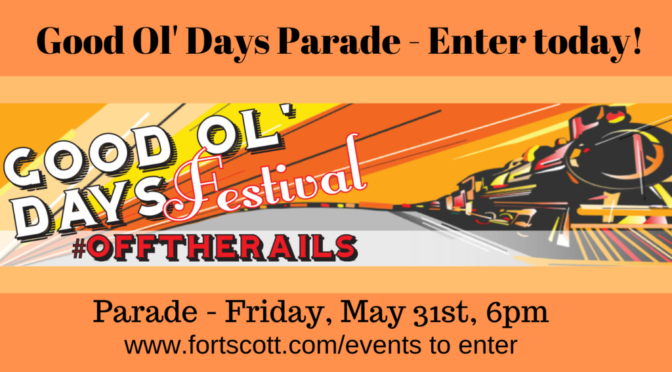 Because the Good Ol’ Days Committee is teaming up with both Fort Scott Munitions and the Fort Scott National Historic Site, the parade will be opened to all types of transportation. Fort Scott Munitions will be hosting a large car & bike show this year, and will be auctioning off a motorcycle for charity. The Fort plans to do a comparison of ambulances from the early 1900’s through today. They will have a fire truck & ambulance on Skubitz Plaza, an Air Ambulance on parade grounds, possibly a military helicopter, an original ambulance cart from the early 1900’s, re-enactors, and much more. Good Ol’ Days website by clickinghere. 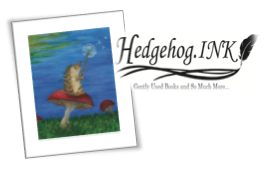 Second Saturday Storytime at Hedgehog.INK Bookstore has been changed from 10:30 a.m. on April 13 to 10:00 a.m., to allow the children to attend the Easter Egg at Buck Run at 11:00 a.m.
Arnold Arena, located on the Campus of Fort Scott Community College, 2108 S. Horton St.
You and your family can get a 50 minute narrated tour of Fort Scott this Saturday on Dolly the Trolley, during the All Hit 103.9 Home, Sport, Farm, & Garden Show! Dolly will be running every hour, on the hour beginning at 10 am, with the last tour departing at 3 pm. All tours this Saturday will leave and return to Arnold Arena. To get your free tour, you must have a ticket, and those free tickets will be available on a first come, first served basis at the visitfortscott.com booth inside the Home show. Tickets will be available this Friday evening from 5 pm – 8 pm, and Saturday from 9 am – 3 pm. 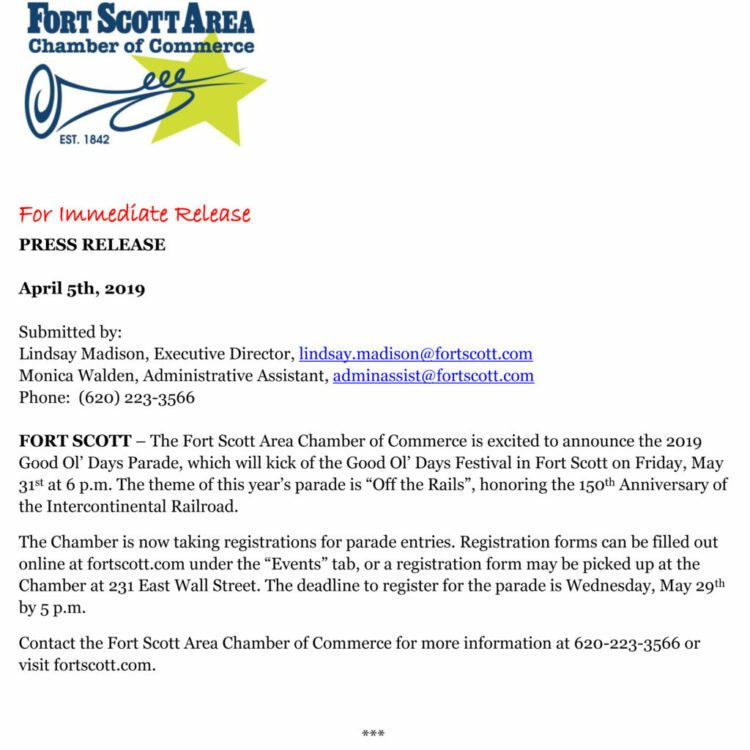 For more information, you can log on to visitfortscott.com. Fort Scott Community College welcomes more than 1600 high school students from surrounding areas for AGGIE DAYS! 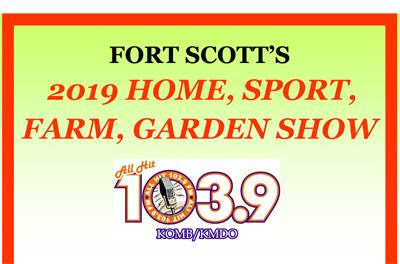 5-6 KOMB 103.9 FM Home, Sport, Farm & Garden Show – Arnold Arena on the campus of Fort Scott Community College, 2108 S. Horton St.
Tickets are $20 for Friends members, $25 for non-Friends members. 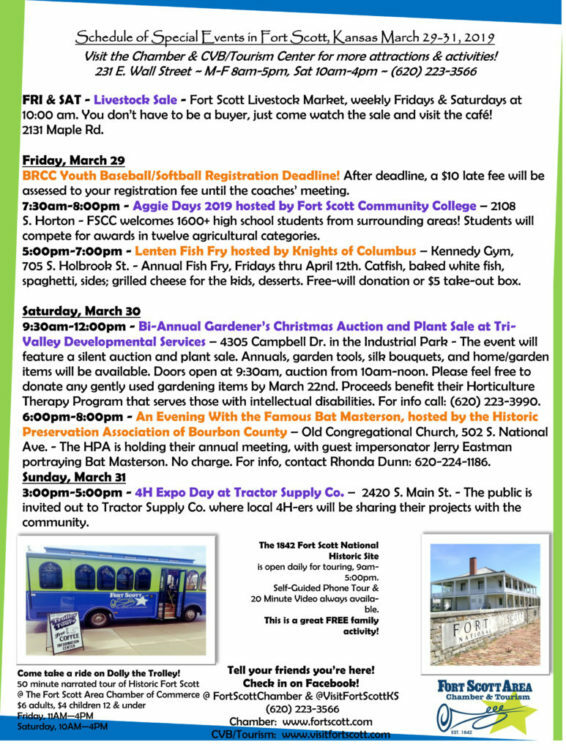 On sale now at the Chamber of Commerce, 231 E. Wall St.
9 Historic Preservation Association of Bourbon County Meeting – Old Congregational Church, 502 S. National Ave.
Board meeting at 6:30pm, program at 7pm. We will have great fellowship, refreshments, and a door prize – hope you can attend! Location: 1101 S. Barbee St.
for additional information on our website click here! Visit the KOMB 103.9 FM website by clicking here. THE ANNUAL CIVIL WAR ENCAMPMENT ON THE GROUNDS OF FORT SCOTT NATIONAL HISTORIC SITE WILL BE HELD SATURDAY AND SUNDAY, APRIL TWENTY-SEVENTH AND TWENTY EIGHTH. IN CONJUNCTION WITH THIS EVENT, THE FRIENDS OF FORT SCOTT NATIONAL HISTORIC SITE WILL BE HOSTING THE SECOND ANNUAL CIVIL WAR CAMP DANCE. 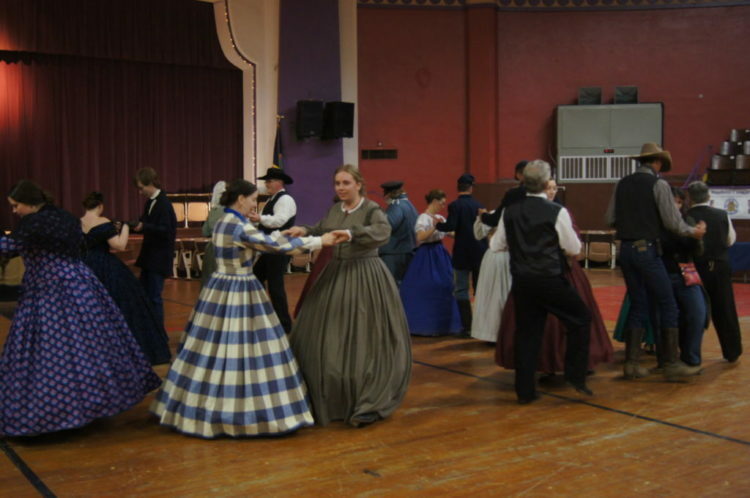 LOCATED IN DOWNTOWN FORT SCOTT, HISTORIC MEMORIAL HALL WILL BE FILLED WITH THE SOUND OF MUSIC FROM THE EIGHTEEN HUNDREDS ALONG WITH WHOOPING AND HOLLERING AND DANCING FEET AT THE CIVIL WAR CAMP DANCE THE EVENING OF SATURDAY, APRIL TWENTY-SEVENTH. 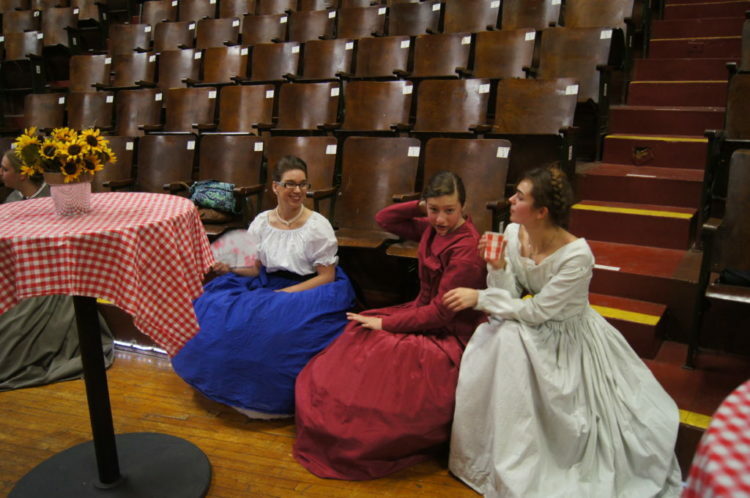 PERIOD DANCES AND MUSIC ARE SURE TO ENTERTAIN PARTICIPANTS AS THEY BRING HISTORY TO LIFE. 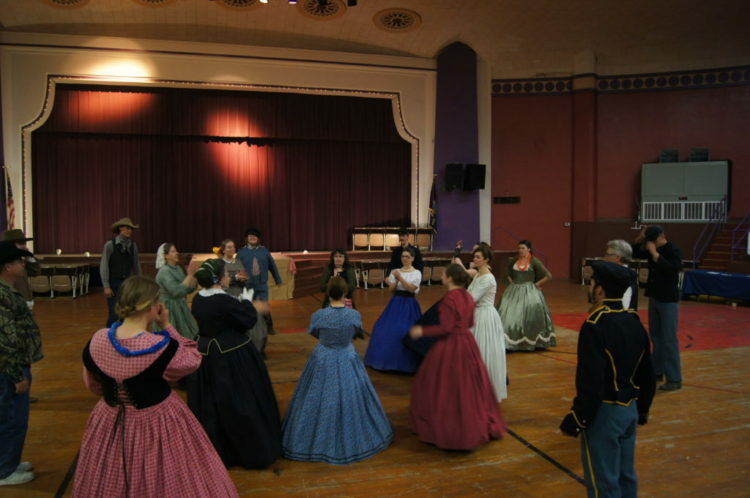 THE CAMP DANCE IS HELD TO COINCIDE WITH THE CIVIL WAR ENCAMPMENT WEEKEND AT FORT SCOTT NATIONAL HISTORIC SITE. IT GIVES THE VOLUNTEERS ATTENDING THE ENCAMPMENT AN OPPORTUNITY TO GET TOGETHER, HAVE A GOOD TIME, AND BRING HISTORY ALIVE IN A SOCIAL ATMOSPHERE. THE PUBLIC IS INVITED TO COME AND JOIN IN THE DANCING OR JUST TO WATCH. WE ENCOURAGE, BUT DON’T REQUIRE, THOSE WHO ATTEND TO COME DRESSED IN 1860S CIVIL WAR ATTIRE, OR DRESSED AS1800S WESTERN PIONEERS. IT SETS THE TONE FOR THE EVENING. ALL AGES ARE WELCOME. COME JOIN US AS WE LEARN 1800S DANCES TO 1800S MUSIC. THE DOORS OPEN AT SIX-THIRTY AND DANCING BEGINS AT 7:00 PM. 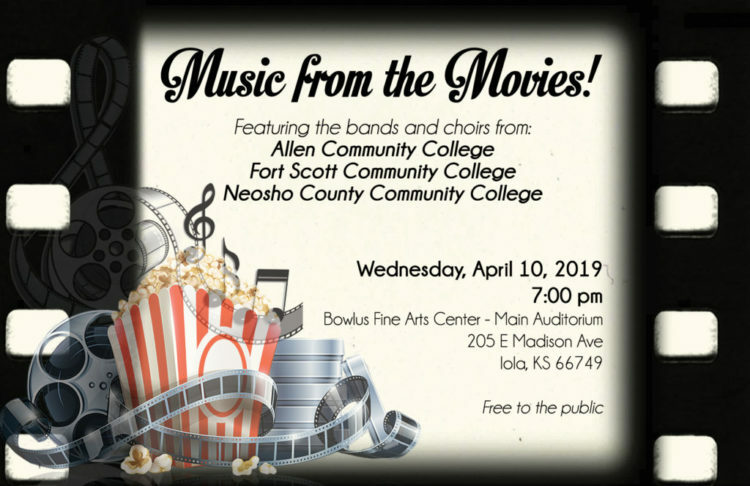 THE COST OF FIVE DOLLARS PER PERSON COLLECTED AT THE DOOR GOES TO THE FRIENDS OF FORT SCOTT NATIONAL HISTORIC SITE. FOR MORE INFORMATION GO TO FACEBOOK AT FORT SCOTT KANSAS EIGHTEEN HUNDREDS DANCING. Friends of the Fort Dance.